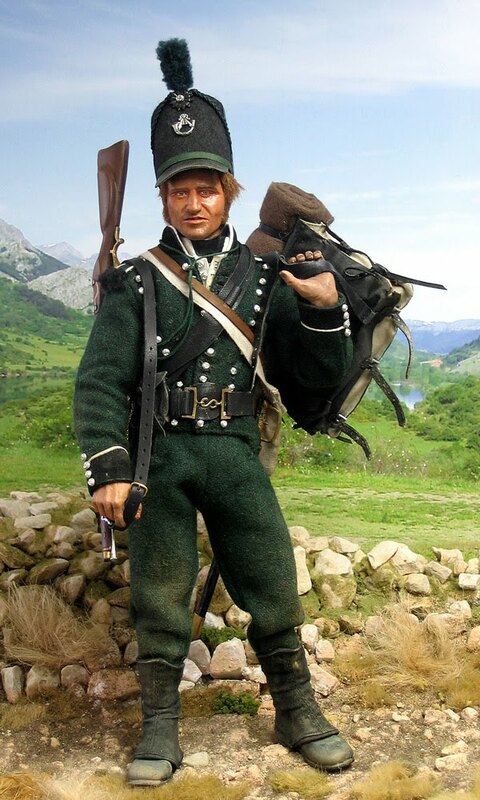 The immortal exploits of the Light Division in Spain are legend ; and the "Sharpe" series has made the 95 Rifles into a kind of public property . Such prominence has drawbacks : their 20th century recreation in book and film has led to great distortion of their original role , and it's very difficult to get the dimmer kind of enthusiast to realise that Sharpe is all fiction : the historical 95th were not a kind of Regency Special Forces ! Their actual role was more straightforward ; they were specialist skirmishers, deployed in front of the main Line to neutralise French skirmishers, win the firefight and harass the enemy , particularly by shooting officers and artillery crews. They were also invaluable in holding bridges and passes ; and in sieges , where their accurate fire could silence an artillery battery. They did it very well , and there is no doubt that because of their training they were an elite corps... but they did not win the war , and there were never very many of them. 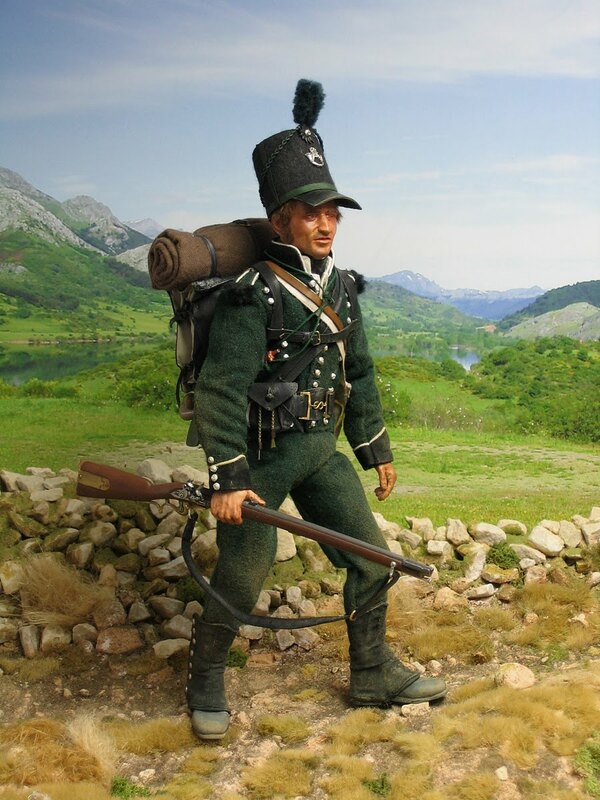 They were formed after the Army had been badly damaged by French skirmishers during the Flanders campaign of 1799 : it was decided to retrain the Light Infantry element , both by creating designated battalions , and retraining the Light company of each Line battalion. Additionally , the Experimental Corps of Riflemen were formed and trained by German experts. 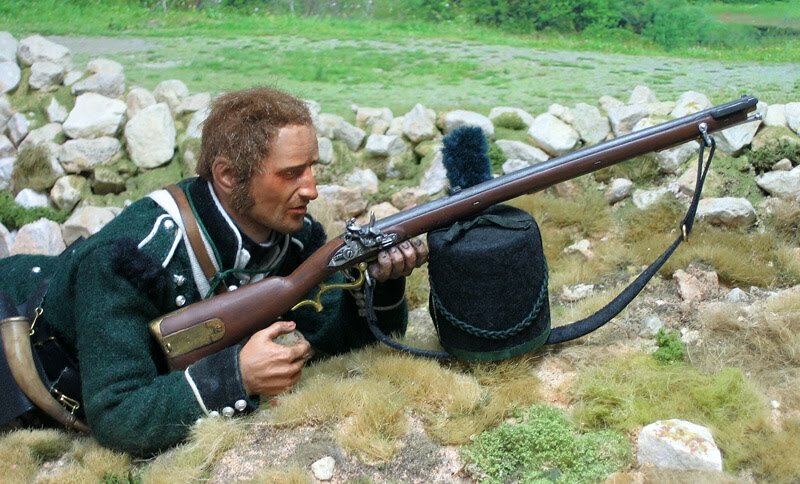 Rifles were nothing new : but their use by British ( rather than German Allied ) troops was. The upshot was that by about 1808 Rifles were all the rage : two battalions of the 95th were formed, the 60th Regiment raised a rifle battalion , and such was the enthusiasm for the new fashion that several Miltia battalions also appeared. In time , the Portugese Cacadores ,and the KGL Light Battalions were also armed with them . Fashionable and very wealthy young men pulled all the levers of Influence to command them : though men of his background were commissioned in many Regiments , Sharpe would never have stood a chance of a commission in the 95th . The rifle chosen was the Baker : designed as a serviceable rather than a refined weapon , it had real advantages , and several drawbacks, those being the reason it was not adopted wholesale by the Infantry. It was useful out to 300 yards , dangerous at 200 , deadly at 100. The musket was of little use above 80 yards.... but could be fired three times faster. Battles were won by concentrated , rapid musket volleys from the Line at very close range , ideally below 60 yards. At that range the rifle was no competitor if loaded with a tight-fitting bullet for accuracy , but the Riflemen got round that problem by carrying sub-calibre ammunition that could be loaded loose, and thus as fast as a musket . They thus had an all-purpose weapon. It was still delicate and required careful use and training, but it gave them a great advantage. Each brigade had a company of riflemen attached , which worked as a screen out in front. They were supported at shorter range by the Light Infantry companies, more numerous , firing faster but with less accuracy. Behind them were the formed ranks of the Line , waiting with ordered muskets , and preferably in cover from artillery, ready to deliver the deciding volley , and charge with the bayonet . This three-layer formation won the battles of the War. The figure is based on the DiD offering : but there are so many mistakes in this figure that he's effectively built from scratch. 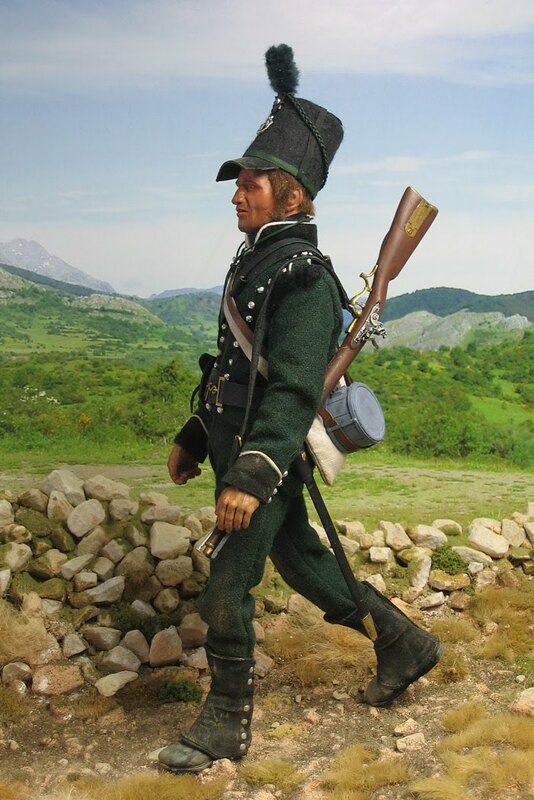 The only thing I have used is the retailored green uniform itself , and the gaiters . Despite their fame , almost nothing of the original uniform and equipment survives to work from. going back to original documents rather than just parroting the received wisdom from the textbooks. I recommend their website. Some items which may seem surprising , but based on the new research : The shako has a square cut peak, a pewter buglehorn badge , and a green band round the base. The pack is not the "Trotter " ( a myth ) but the envelope type, in black. The belts are 2.5 inches wide , and there is a small priming flask carried in an armpit pocket in the jacket. The main pouch on the shoulder belt holds the cartridges for rapid fire ; the drawstring pouch on the belt carries the patched rifle bullets . 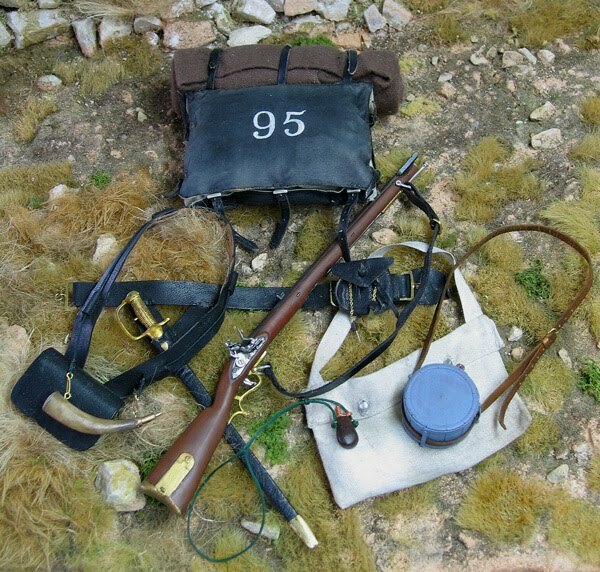 The big horn is for a measured charge ; the little flask for priming.The canteen and haversack are the proper size, often underestimated in many depictions. Of course , he looks fairly tidy . The well-known Rifles memoirs all emphasis the decrepit state of the uniforms , but some of that must be old soldiers moaning. All Regiments were re-uniformed during the winter , so must have presented a reasonably complete appearance in the Spring , at least for a month or two. After a summer campaign , of course, they often looked worse than sweeps. When skirmishing , it was normal practice to dump the pack. In this view you an also see the length of the Baker sword, regarded with rather mixed feelings , since it often tangled in the legs, though designed to give the same reach as a bayonet on a full-length musket. Contemporary sketches and training manuals suggest lying down to shoot : the rifle could also be loaded in this position .